This publication aims to formulate a broader framework of integration which is required for cities to transition to sustainable, resource efficient development and to realise green urban economic growth trajectories that are equitable and sustainable. It frames the question of urban sustainability in a conceptual foundation and language that places human development objectives at the heart of urban sustainability transitions. It presents a set of policy positions and recommendations within a strategic framework that is derived from this understanding. 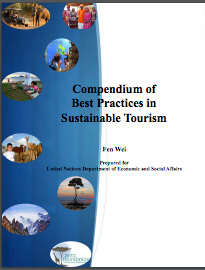 It also includes case studies of (touristic) cities across the world. Rio+20 will see hundreds of delegates flying to Brazil from across the world, filling the city’s hotels and traveling around the region; actions which could lead to a potentially high carbon footprint for the summit. UNEP has partnered with the Government of Brazil to produce a Green Passport travel guide available in English and Portuguese. The Rio +20 Green Passport provides a physical passport-style document packed with advice and tips on how to make a holiday more sustainable.